HIGHLAND HEIGHTS, Ohio -- If you don't like being called "sir" or "ma'am," don't visit StoneWater Golf Club. If you get as much joy out of hefting your golf clubs out of your trunk as you do draining a 50-foot snaking putt, it's suggested that you stay away, too. Look, don't even bother with this golf club if you insist on lugging a bucket of balls to the range. When you pull up to StoneWater's awe-inspiring clubhouse, someone will greet you when you step out of your car, and ask you to pop the trunk so he can hustle your bag to the nearest cart. And when you head off to the range to loosen up, there will be range balls awaiting you, neatly stacked into a pyramid. 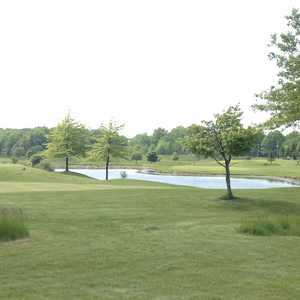 StoneWater, which Golf Digest ranked as one of the top four courses in 1997, and the best public golf course in Ohio and the 40th best public course in the country in 2003, gives everyone the opportunity to enjoy a country club experience without plunking down a million bucks for a membership. If getting your shoes shined and tearing into a hand-cut steak at the StoneWater Grille prompts you to consider becoming a member, you can because it's a semi-private course. But if you find you're a little light in the wallet and would rather return through public access, don't worry -- only 20 percent of play is currently through members, which means you won't have trouble getting a tee time unless you're talking weekend prime times. Designed by Dana Fry of the Fry/Hurdzan Design Group, the course features bridges, sand traps, tee boxes, and lakes lined with sandstone, quarried on site as the course was being built. Five different tee placements, ranging from 4,952 yards to 7,045 yards, accommodate golfers from Joe Hacker to Joe Pro. If you quadruple-bogey a hole, don't worry, be happy -- enjoy the view of wetlands and, if you're playing in the fall, the breathtaking array of colors provided by the maples, oaks and other trees. Erik Hansen, StoneWater's general manager, says the course's signature holes are Nos. 1, 2 and 3. "It's a very humbling beginning," he says. And how. No. 1, a par-4 that plays 411 yards from the gold tees, features a meandering stream that crosses the fairway about 260 yards from the tee and continues down the right side of the hole to the green. Most golfers won't be able to reach it from the tee, but slice the ball on your approach shot and your ball will be doomed to a watery grave. No. 2 is much too cruel for golfers who haven't even soiled their shirts yet. Another par-4, it plays to a robust 445 yards from the gold tees and 414 from the white. Fairway bunkers offer menace from the tee and protect both sides of the green. There's no relief to be found at No. 3. Shellshocked golfers must deal with a carry over water and marsh to a stonewalled green on this lengthy par-3. After your round, make sure to contact your loved ones before you hit the enormous and elaborate locker room for a shower -- you might get lost. And don't go looking for a hot dog and a bag of cheese doodles. You deserve better than that -- the bag boy who cleaned your clubs told you so. Chef Neil McKenzie from Scotland, who used to work for The Ritz-Carlton, will fix you up with veal scallopini or -- check this out -- seared pork medallions, caramelized onions and apple ginger sauce with potato and sausage lasagna. Hopefully, you won't run into your cardiologist on the way out. Currently, only 20 percent of play is currently through members, which means you won't have trouble getting a tee time. Take I-480 east to I-271. Exit at Wilson Mills Rd./Highland Heights (Exit 36). Turn west onto Wilson Mills Rd. and go 1/4 mile to Miner Rd. Turn right on Miner Rd. and go to second traffic light. Turn left on Aberdeen Blvd. StoneWater will be 1/2 mile down on right. Take I-90 east and exit at Bishop Rd./Wickcliffe (Exit 187). Turn south onto Bishop Rd. and go 4 miles. Turf left on Aberdeen Blvd. StoneWater will be 7/10 mile down on left. Off-season (April 17-October 27): 18 holes Mon-Sun. $59, $39 Mon.-Sun. 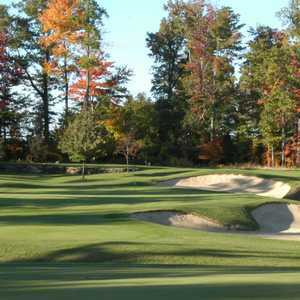 after 3 p.m. ... Spring-fall season (April 18-May 22, Sept. 29-Oct. 26): 18 holes Mon.-Sun. $74, $49 Mon.-Sun. after 3 p.m. ... Summer season (May 23-September 28): 18 holes Mon.-Sun. $74 before 11, Mon.-Thur. 11-3 $84, Fri. $84 before 11, Fri. $99 11-3, Sat.-Sun. $99 before 11, $84 Sat.-Sun. 11-3.